Yammer made its debut appearance in 2008. 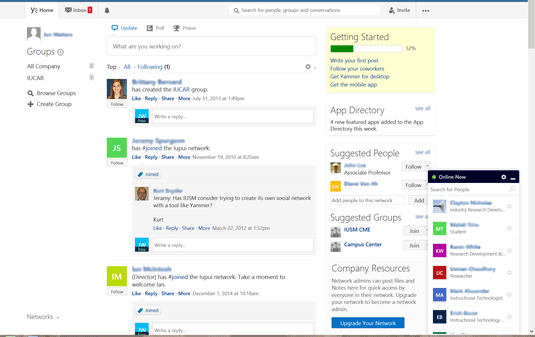 Developed by a former PayPal executive, Yammer is a social networking solution for the workplace. Seeing the potential, Microsoft purchased Yammer in 2012 for a whopping $1.2 billion. Now the site boasts a clientele of more than 85 percent of Fortune 500 Companies. Often referred to as the “Facebook for business,” Yammer offers you many familiar tools for collaborating with others in your company. This includes Suggested Groups, Suggested People, Networks, a Feed, and much more. Yammer Enterprise standalone ($3 per user per month): Offers additional support, security options, administrative control, data analytics, and integration. Office 365 for Business ($5-$20 per user per month): Intended for midsize businesses and enterprises, this plan gives you full access to the Cloud suite and gives IT additional management capabilities. Office 365 for Education ($2.50-$7.50 per user per month): Offers collaborative solutions for educational institutions. For additional information about pricing plans, check out Yammer’s pricing page. You may be rolling your eyes and thinking, “Oh, great. Another social site I have to keep up with.” And to a certain extent, you may be right. It is one more site you have to check and another thing to add to your to-do list. But consider this: Instead of being an additional chore, Yammer may actually save you time. Here’s a scenario: You come into the office early to prepare for a meeting where you hope to have an opportunity to provide input on a current project; and ideally, you hope your coworkers have done the same.